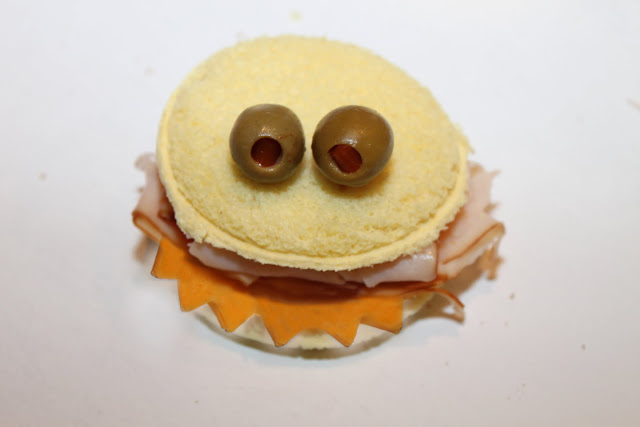 My absolute favorite part of the things I made for my son's Little Monster birthday party was the monster sandwiches. I originally planned on making 3 different kind of monsters, but after I made this guy, I thought "how can they get any cuter than this?" First, take a cookie cutter and cut the center out of your bread slices. Don't have a round cookie cutter on hand? No problem, do what I did and turn a glass turned upside down and use a knife to cut around the edges. Next, put your choice of fillings inside (I went with ham and turkey lunch meat) and any other condiments you think your guests would like. 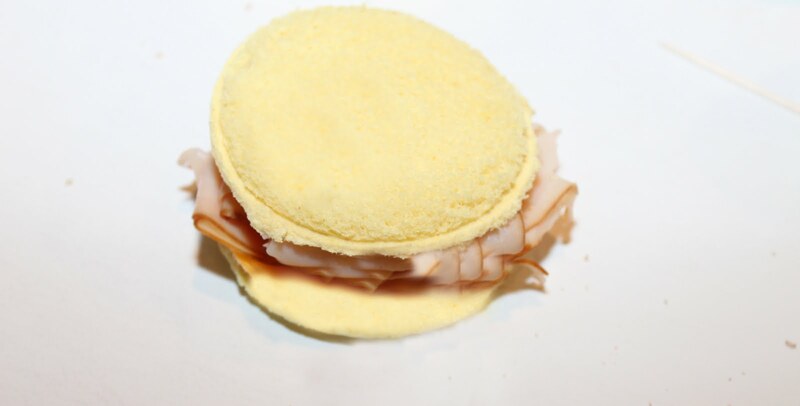 To make the teeth, simply cut jagged edges around half of a slice of cheese and insert the cheese inside the sandwich on the bottom. Make the eyes by snapping a toothpick in half, and inserting each half into an olive. 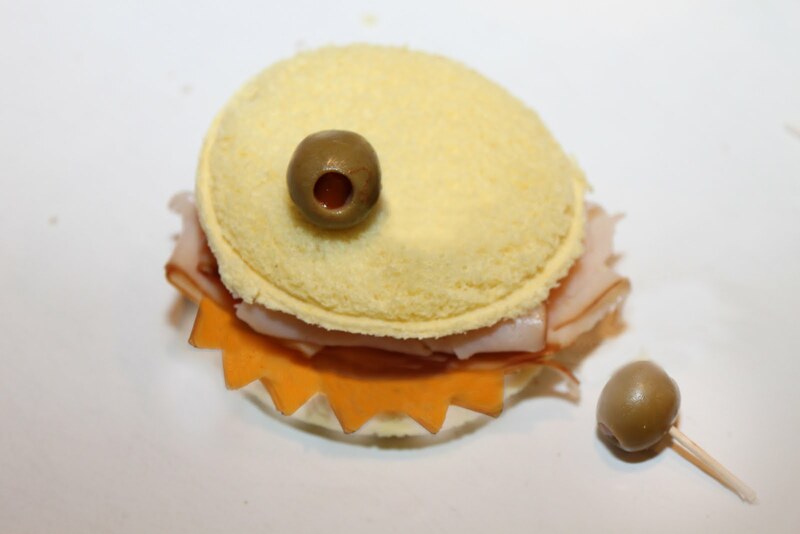 Stick the olives in the top of your sandwich. How fun would it be to make your child a whole monster-themed lunch for school one day? If you had the time (and the endurance to cut out multiple monster cheese teeth), you could always make a whole pack of monster sandwiches for a crowd. These are so cute! My daughter always loves a fun lunch! They look great! My daughter saw the picture and immediately wanted to do some too! These are so cute! What a great way to get kids to eat things they may not otherwise like...like olives! These are so cute- it's scary! Ha! I love creative ideas with food. Visiting from Serenity Now. 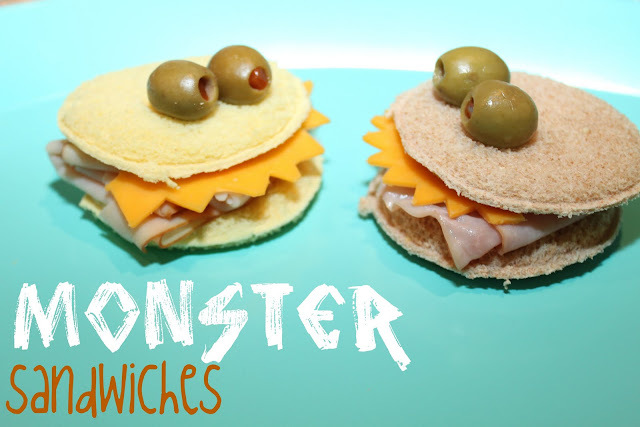 That plate of monster sandwiches is just so cute! I have a few little guys in my life that would really get a kick out of them! So fun stopping by to visit with you! No way! Those are awesome. I love them. Have GOT to remember these - my girls would go crazy, thanks for sharing! these are too adorable. the olives look like googly eyes! Too cute! Olives are going on my shopping list this week. What a simple, fun idea this is! 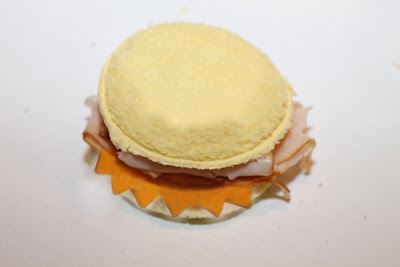 I've featured your post in my "Halloween Meals" blog post today so that others can drop by and enjoy your creativity too. Thank you for sharing it. I tried Patti Lundgren's idea of using pieces of spaghetti instead of toothpicks and they came out great! My son does not like olives, so I used green grapes with a pomegranate seed for the eyeball. Thanks for the wonderful idea!